IT'S POSSIBLE: Julie Andrews was the original, and Brandy the latest, but for several generations, dewey-eyed Lesley Ann Warren will always be their Cinderella, thanks to the CBS re-make of the R&H TV musical that aired annually from 1965 to 1974 and later on cable...The home video of this Cinderella had been out of circulation for a few years, but that will change in January, when Columbia Tristar Home Entertainment issues a new version, plus the premiere DVD edition...The DVD will feature several bonus supplements including a ""Sing-a-long"" feature and a ""Making of"" documentary with Warren, joined by her Prince (Stuart Damon) and her Fairy Godmother (Celeste Holm)...And speaking of Fairy Godmothers, Eartha Kitt will re-charge her magic wand for the resumption of the popular stage tour of Cinderella, beginning in Hershey, Pennsylvania, in December, with upcoming cities to include Washington, D.C., Boston, Philadelphia, Birmingham, St. Louis and San Antonio. FLOWER DRUM BLOOMS AGAIN: A new adaptation of the Rodgers-Hammerstein-Fields musical Flower Drum Song is having its world premiere at the Mark Taper Forum in Los Angeles, October 2-December 2... Adapted by Tony Award-winner David Henry Hwang (M. BUTTERFLY) and directed and choreographed by Robert Longbottom, the cast includes Tony winner Lea Salonga as Mei-Li, Jose Llana as Wang Ta, Sandra Allen as Linda Low and Jodi Long as Madame Liang...For more information, visit www.taperahmanson.com. Some Enchanted Evening: A new U.S. National Tour of South Pacific, presented by Barry and Fran Weissler in association with Clear Channel Entertainment, stars Michael Nouri as de Becque, Erin Dilly as Nellie, Armelia McQueen as Bloody Mary, with Lewis Cleale as Lt. Cable...Directed by Scott Faris, with Jerry Zaks serving as production consultant, SOUTH PACIFIC is currently in the midst of a year-long tour, with upcoming cities to include Chicago, Tampa, Memphis, Boston, Atlanta, New Orleans, Houston and Baltimore...In December, Britain's Royal National Theatre will present its own production of SOUTH PACIFIC, directed by Trevor Nunn with musical staging by Matthew Bourne. THE HILLS ARE ALIVE: In June, the Hollywood Hills were alive with the sound of SING-A-LONG SOUND OF MUSIC, when a record crowd of nearly 18,000 filled the Hollywood Bowl for the local LA premiere of the movie/karaoke phenom, joined by celebrity hostess Kathy Najimy and special guest Charmian Carr; also on hand were the film's legendary director, Robert Wise, and screenwriter, Ernest Lehman...Invited by Robert Redford to give a special performance in Salt Lake City to benefit the Sundance Film Institute in early September, SING-A-LONG will also be screened this Fall in Nashville, Milwaukee, Miami, Tampa, West Palm Beach, Buffalo, Hartford, San Diego, Santa Barbara, Seattle and Austin, along with return engagements set for San Francisco, St. Louis, Chicago and Philadelphia... Visit www.singalonga.com for worldwide updates. BERLIN FESTIVAL: In conjunction with the publication of THE COMPLETE LYRICS OF IRVING BERLIN (see p.1), several events this Fall pay tribute to the iconic songwriter, including evenings at the Century Club and the Friar's Club in New York City...On October 28, Berlin daughter (and the book's co-editor) Linda Emmet, will join Mary Cleere Haran in hosting an all-Berlin tribute as part of the 12th annual Mabel Mercer Foundation/New York Cabaret Convention at New York's Town Hall; Jeff Harnar, Julie Wilson, Amanda McBroom, Phillip Officer, and K.T. Sullivan are among those scheduled to perform...For more, visit www.mabelmercer.org...On November 2, the Chicago Humanities Festival will present an all-Berlin program as its '01 Benefit Gala; PUTTIN' ON THE RITZ will feature a stellar line-up including Marilyn Horne, Taina Elg, Melissa Errico, and Bolcom & Morris, with Max Morath narrating, and Kevin Stites conducting...For more, visit www.chfestival.org. PBS TO AIR NEW RODGERS DOCUMENTARY Thirteen/WNET New York's AMERICAN MASTERS (Susan Lacy, Executive Producer) will present the world premiere of Richard Rodgers: THE SWEETEST SOUNDS, on Sunday, November 4, 2001 at 9 p.m. (ET) on PBS (check local listings). ""This is a film about the music and the man who created it,"" says producer/director Roger Sherman. Working with writer Laurence Maslon over a year-long period, Sherman interviewed many of the stars of Rodgers' stage and film musicals, including Julie Andrews, Celeste Holm, Shirley Jones, Diahann Carroll, and Barbara Cook; as well as such interpreters of the Rodgers songbook as Billy Taylor, Maureen McGovern, Mary Cleere Haran, and Richard Rodney Bennett. The critics Jonathan Schwartz, John Lahr and Ethan Mordden contribute analyses, as do such musical theatre artists as Andrew Lloyd Webber, Trevor Nunn, John Mauceri and Rob Fisher. R&H President Ted Chapin and members of the Rodgers family -- daughters Mary and Linda, and grandson Adam Guettel -- also provide insight. THE SWEETEST SOUNDS features vintage film clips and rare television footage (including a remarkable sequence in which Rodgers and Hammerstein deconstruct one of their own songs), as well as glimpses of legendary performances by Judy Garland, Frank Sinatra, Barbra Streisand and others.Though the program covers the arc of Rodgers' life and work, its emphasis is on the music, with periodic sequences that delve deeply into different aspects of his creativity. ""These 'sessions' show us how and why the music works so brilliantly,"" says Sherman. ""For example, in one sequence Andrew Lloyd Webber plays 'Do Re Mi' on the piano, showing how deceptively simple and marvelous Rodgers' compositions are. Billy Taylor and Barbara Carroll play and discuss 'My Funny Valentine': they tell us that the minor key makes it 'melancholy,' and that the mood is expressed 'in just three notes.' We close that section with amazing footage of John Coltrane, performing his famous rendition of 'My Favorite Things,' which we hope will give viewers insight into how jazz is created."" 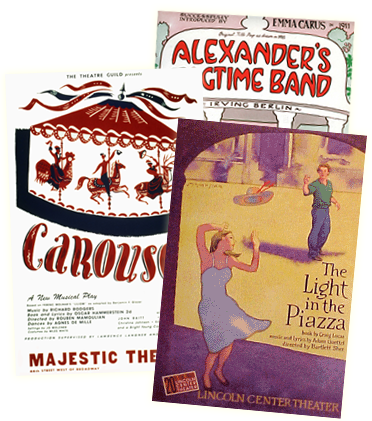 Another sequence, demonstrating Rodgers' skills as a dramatic composer, dissects his score for the Bench scene (""If I Loved You"") from Carousel, while a focus on Rodgers and dance incorporates interviews with contemporary choreographers Kathleen Marshall and Baayork Lee.